Club for Growth Prez on the Rove Counterattack: "In 2004, He Went Against Toomey"
I talked to Club for Growth president Chris Chocola today for a story about the much-hyped new American Crossroads project that will intervene in primaries before Todd Akins can emerge. 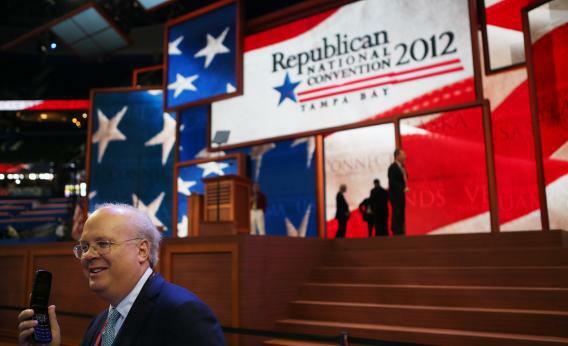 It’s a somewhat complicated story with a huge noise-to-signal ratio – everyone who claims to be a GOP kingmaker can rant about Rove’s perfidy. But Chocola’s group has invested big early money to defeat a bunch of Republicans, and come under fire ever since the Mourdock loss in (Chocola’s own) Indiana. Before my story goes up, some of the Q&A. Slate: How do you read this story about Crossroads? Do you view it as a threat to what the Club does? Chocola: Well, facts matter, and the fact is that you can’t use an aberration to design a rule. What they want to focus on are the aberrations of Todd Akin. I would have three words for them in response: Rubio. Toomey. Cruz. They never would have thought that those were the right candidates, they never would have supported those guys, and now they’re looked at as the future of the Republican Senate. Then I’d have to go to some other names: George Allen, Tommy Thompson, Rick Berg, Denny Rehberg – why’d those guys lose? They were clearly establishment. Rick Berg was THE candidate for North Dakota, with all the establishment behind him. Slate: Can you imagine backing the same candidate? Will you talk to (the Conservative Victory Project’s) Stephen Law? Chocola: I don’t have any problem talking to Law or Rove or any of those guys. They’re right about Akin. We didn’t endorse him. But to try to say there’s a fix for a problem like that – there isn’t. There is no principle upon which to base their view. It’s this phantom electability standard. I don’t know what “electability” means. I do know what principles mean. Tommy Thompson was electable, under their definition. Pat Toomey was not electable, under their definition. I’m not picking a fight with Karl Rove but in 2004 he went against Toomey. Slate: I guess my question is whether you can “fix” the electability problem by entering a primary, or whether you need to consider the supply side. Chocola: If you focus on principle, not electability, you get candidates who can win. Candidate quality matters. Politics is marketing, and you have to market your ideas in an appealing way. But you start with the ideas. Dede Scozzafava, who the party picked in the NY-23 special election, ended up working for Cuomo. Lincoln Chafee is an independent now, who endorsed Obama, twice. Charlie Crist – now he’s a democrat. Republican primary voters are conservative, and if we nominate a conservative, we’ll do fine. It’s hard to spend more than $20 million in a primary like [failed Texas U.S. Senate candidate] David Dewhurst did, before he lost to Ted Cruz.